Celebrating its 20 year-birthday only last month this year, Google is all set to continue with its impressive work. Apart from dominating the search engine arena, Google started rolling out its products, developed by Google itself, with the Chromebook Pixel being launched 5 years ago in early February 2013. The Google Pixel segment offers smartphones, tablets, and laptops which work on the Android OS or Chrome-OS. With Google’s release of Pixel and Pixel XL back in October 2016, Google ditched the older Nexus flagship model. Google has constantly strived to make smartphones that offer high-end features and showcase the features of the Android OS easily. The infographic created by HomeTop below shows the long and illustrious journey of Google’s smartphones so be sure to check it out. There is no question that Google has been a pioneer in introducing great hardware specs for its phones, but the Pixel series takes the cake. The first of the Pixel family, Pixel and Pixel XL, came with the terrific specifications. However, the most attractive feature of these phones was the presence of a massive snapper, which ranked as the best smartphone camera on DxOMark Mobile with 90 points only until HTC released U11, which too, ranked with 90 points. The original Pixel smartphones were made with a partnership with HTC and housed only a single rear camera of 12.3 MP rear camera, and came with f/2.0 lens and IR laser-assisted autofocus. The front cameras for both the smartphones were equipped with an 8 MP front camera with f/2.4 lens. Google Pixel came with a handy display of 5.0″ AMOLED display screen, and the XL came with a slightly larger screen, 5.5″ AMOLED. Both of these phones house non-removable batteries and were wireless-charging compatible, just as its Nexus predecessors. Design-wise, the Google Pixel, stood out with its solid two-tone nature and the “Google” mark at the bottom of the smartphone on the rear side. Additionally, the smartphones came loaded with the latest 2016 Android OS, Android 7.0 Nougat, which is upgradable to Android P (the present latest version). Soon after, Google began working on the next generation of Pixel smartphones. Google intended to keep developing a smartphone that the company can sell to the masses. Furthermore, the next generation came with considerable changes. First off, Google went with two different companies for both the Pixel variants. Google partnered with HTC to build the Google Pixel 2 smartphone and with LG to build the Google Pixel 2XL. The screen dimensions for both the phones remained handy and stood at 5 inches for the Google Pixel 2 and 6 inches for the Google Pixel 2 XL smartphone. Both of these phones came with considerable up-gradations from the previous models and Google even threw in some AI features for the customers, which definitely added a touch of premium-feel to the smartphones. Furthermore, Google stuck with its iconic two-tone coloured rear of the smartphones. Looks of the smartphones were not only what Google chose to retain and upgrade. With a better hold on the body, the smartphones came with a better camera with OIS (optical image stabilization) along with previous features of the camera, which again was a big addition to the smartphones. DxOMarkMobile ranked these smartphones with 98 points. With an Aluminum unibody design with hybrid coating, these phones featured IP67-rated water and dust resistance. Apart from this, the two high-end flagships released by Google itself came out in October 2017 with the latest Android OS, Android 8.0 “Oreo,” which is upgradable to Android P.
The next and the newer members of the Pixel family were announced on 9th October this year, and are said to be the most expensive Google Pixel smartphones yet, and rightfully so. These smartphones come with bigger screens and are said to be loaded with even better features. Sticking to its two-toned color nature, Google has decided to stick to 12.2 MP rear camera, just as Google Pixel 2 and Pixel 2 XL. Although the camera specifications are the same, the camera unit is supposedly different, which allows you to take better and more dynamic shots. Making sure that Google pioneers in camera smartphones, it has equipped the front camera with a wide-angle secondary camera (8 MP) to its front camera of 8 MP. Google has maintained the size of these two flagship smartphones exceptionally well by incorporating slimmer bezels and giving an almost full display of the phone. The Pixel 3 smartphone comes with a 5.5-inch screen and the Pixel 3 XL with a 6.3-inch screen. Other than this, Google has decided to amp up the visuals of the phone, design-wise and has added a matte black and aluminium frame to the phone. Furthermore, these phones feature IP68-rated water and dust resistance. If we talk about Google’s motive of developing high-end smartphones, then Google Pixel 3 and Google Pixel 3 XL are the prime examples. With many features that have either been upgraded or added to the smartphones, Google, with its release of these smartphones, will be a step closer to its dream of creating the perfect smartphones for the masses. Apart from the latest models running on Android OS, Android P, Google has also included hardware-based security in the form of the Titan M Security chip, which is better than Google Pixel 2 series and has added more LTE bands for better usage, including support band LTE band 71 for Pixel 3. 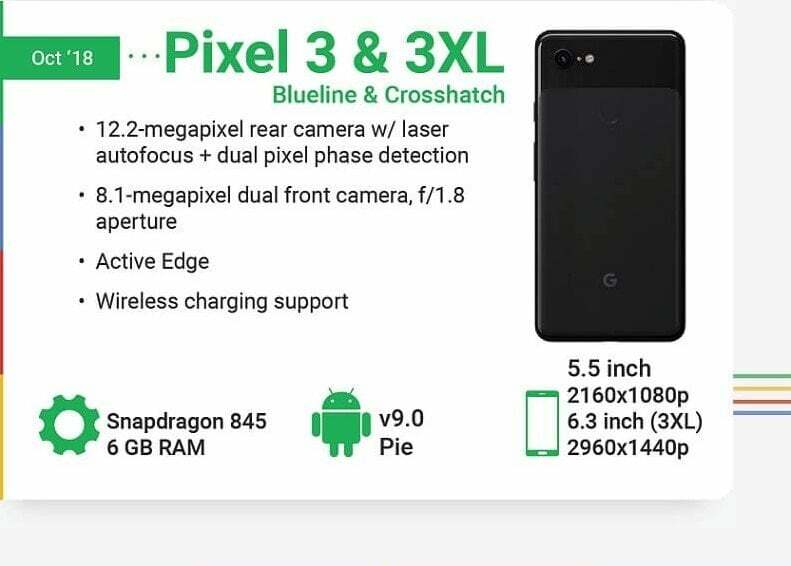 With these many features, the Google Pixel 3 variants are said to be a tad bit expensive for Android users and for the suppliers of various parts for the making of this smartphone. However, truth be told, there is no better phone than Google’s very own for the best Android experience. Plus, you’ll get regular Android updates, security patches and tweaks to the phone for the next three years from the launch of the phone and way before than other Android users!